Share this product and receive a $8.90 sharing discount. 6 1/2" 7 1/2" 7"
Please allow 10-14 business days for processing as this item is cast to order. Currently only size 6 1/2" is in stock. 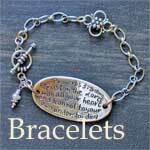 This handcasted and assembled bracelet with scripture has a unique garnet dangle. The materials are .925 Silver, a garnet dangle, 3 gold chains, and a silver toggle. This popular mix of materials allows this bracelet to be worn with other silver or gold jewelry. We offer this bracelet in both 6 1/2", 7", and 7 1/2" lengths. 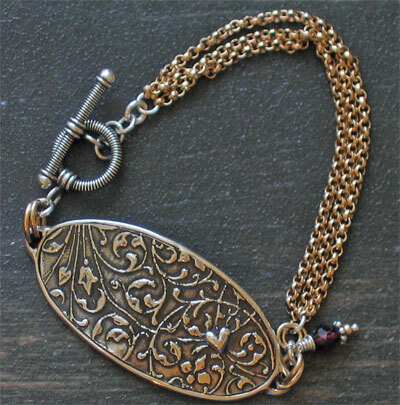 The hand cast oval medallion measures 2" in length. If you need a shorter or longer chaing, please contact us. The artist is happy to accomodate by providing shorter and longer lengths. Please allow up to 3 weeks for special orders. This particular bracelet has a lovely vine and flower design on the front of the bracelet along with one solitary heart. The backside of the medallion has Mark 12:30 cast into it, 'Love the Lord your God with all your heart and with all your soul and with all mind and with all your strength' A beautiful bracelet for young and old alike.